"I think, ultimately, if you make a record and nobody knows what bin to put it in, you've succeeded. John Duffey used to say, 'Be different at all costs.' Ben Eldridge and I were listening to Creedence Clearwater Revival, and I was listening to Grateful Dead. When we got ready to make a record, we'd try to find original tunes to do." Quoted by Juli Thanki in "An Interview with John Starling, Founding Member of the Seldom Scene," Engine 145: A Roots Music Publication, November 7, 2011. Durham, North Carolina, native John Starling began his immersion in music by listening to a number of radio stations that featured Saturday evening live country music programs. These included the Old Dominion Barn Dance from WRVA in Richmond, Virginia; theWorld’s Original Jamboree from WWVA in Wheeling, West Virginia; and, to a lesser extent, the Grand Ole Opry from WSM in Nashville. He was also a fan of rhythm and blues programming from Nashville’s WLAC. Although artists like Bill Monroe and Flatt and Scruggs held his attention, John’s first instrument was an electric guitar. After graduation from high school, he took undergraduate and medical degrees at the University of Virginia in Charlottesville. Picking parties there brought him into contact with other bluegrass musicians, notably Paul Craft and Ben Eldridge. When John moved to the Washington, D.C., area in 1968 for his internship, he became a regular at jam sessions in Ben Eldridge’s basement. After a tour of duty in Vietnam and a year of general surgery in North Carolina, John was back in the D.C. area. In his spare time, he made music with several former members of the Country Gentlemen. In October of 1971, this informal group was asked to sit in as a substitute for Cliff Waldron and the New Shades of Grass, a popular D.C.-based group that had a regular gig at the Red Fox Inn in Bethesda, Maryland. The group enjoyed performing in public and soon secured a weekly booking at The Rabbit’s Foot on Wisconsin Avenue in Washington, just across the border from Maryland. A dispute over the playing of the club’s television during the band’s performance soon led to their leaving that establishment. In January of 1972, the Seldom Scene – given the name by long-time Country Gentlemen stalwart Charlie Waller – relocated to The Red Fox Inn for a legendary six-year stint. The group included John Starling on guitar and lead vocals, John Duffey on mandolin and tenor vocals, Mike Auldridge on Dobro and baritone vocals, Ben Eldridge on banjo and occasional vocals, and Tom Gray on bass and occasional vocals. Also in the group for several months was Mike’s brother, Dave Auldridge. John Starling’s first stay with the Seldom Scene lasted from late 1971 through 1977. During this time, he became one of the most high-profile vocalists in bluegrass. He was routinely a finalist in Muleskinner News magazine’s annual Bluegrass Music Awards in the Best Lead Singer category. A series of album releases on Rebel Records did much to establish the Seldom Scene’s reputation during this period. Highlights include Act I, Act II, Act III, and Old Train. One of the most consistently best-selling bluegrass albums of all time was recorded over two days in December of 1974 and released as Live at the Cellar Door. 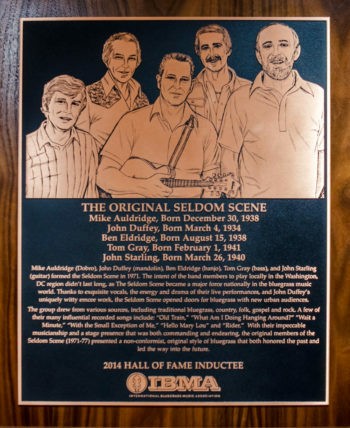 The success of the Seldom Scene was an artful blending of talents by a collective group of individuals, each of whom shone brilliantly on his own. John Starling brought a number of important contributions. Foremost were his rich lead vocals. Described as one of the most distinctive stylists in bluegrass, he excelled at delivering expressive renditions of country and contemporary songs. Equally important was his role in selecting repertoire for the group. John was an articulate songwriter and had a knack for mining other genres of music for material. 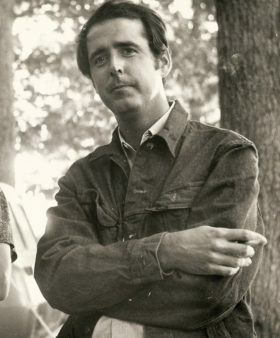 Unlike some writers who work strictly on inspiration, John usually wrote out of necessity, to provide material for recording projects. Despite his musical and medical accomplishments, he possessed a self-effacing, low key personality and tended to downplay his contributions. John was on hand for the last two albums that the Scene recorded for Rebel. The New Seldom Scene Album, a bluegrass/country project, charted new territory for the group with the inclusion of Mike Auldridge’s pedal steel guitar and the radio favorite “California Earthquake.” In 1977, as the group was finishing its first and only all-gospel album,Baptizing, John relocated to Montgomery, Alabama, and exited the Seldom Scene to devote more time to his ear, nose, and throat medical practice. After leaving the Scene, John was by no means musically inactive. In Alabama, he became friends with members of the Front Porch String Band. In addition to giving pointers on the band’s performance techniques, he was instrumental in bringing Claire Lynch’s songwriting talents to the attention of Nashville-based publishers. For a brief period in the early 1980s, John and Claire had a country-oriented group called Ready Section. He served as musical consultant for the 1987 Trio release by Linda Ronstadt, Emmylou Harris, and Dolly Parton, and recorded two solo albums: Long Time Gone (1977) and Waitin’ On a Southern Train (1979). A third disc, Spring Training, with banjoist/songwriter Carl Jackson, won a 1991 Grammy for Best Bluegrass Album. John guested on two anniversary collections that the Seldom Scene issued in the late 1980s and early 1990s. Fifteenth Anniversary Celebration, recorded live at the Kennedy Center, featured a bevy of top-notch guest artists. A November 1991 concert at the Birchmere reunited current and past members, including John Starling, and resulted in the double-disc set Scene 20. That reunion concert likely led to John’s rejoining the band in 1993 and 1994. Retirement from a successful medical practice and another reunion event led to John Starling’s most recent recorded project. A benefit concert for banjoist Eddie Adcock reconnected John with fellow Seldom Scene alumni Mike Auldridge and Tom Gray. The trio decided to join forces and venture into the studio for Slidin’ Home (2007), with Emmylou Harris as guest vocalist. Although he wasn’t seeking top billing, Mike and Tom felt that putting John’s name front and center would give John Starling and Carolina Star name recognition and credibility for future personal appearances. Gary Reid is a bluegrass music historian, journalist, and producer, based in Roanoke, Virginia. We decided we'd play one night in a club, we would try to put out as good of records as we could and then limit our playing within a driving distance of Washington, with a few exceptions... And it was enough to the point that we were making a fair amount of money, and it was also enough where it had not reached the point where we were tired of it. Quoted by Robert Kyle in "John Starling: Medicine Replaces Music," Blueprint: Washington's Bluegrass Newspaper, September 1979. I always liked bluegrass music, even back when the Kingston Trio were popular. I couldn't stand them - I'd much rather listen to Ralph Stanley, and if the truth be known, it probably had a lot more lasting qualities than the Kingston Trio. Quoted by Sheila Berquist in "John Starling: Music and Medicine," Bluegrass Unlimited, February 1986. I’ve started writing stuff again; I’ve got two or three things I’ve written… You never know about your own stuff until you hear it done…. I’m not real happy with my own tunes. I guess it’s like people’s cooking. People don’t like their own cooking. Quoted by Robert Kyle in “‘Long Time Gone’ John Starling Returns,”Blueprint: Washington’s Bluegrass Newspaper, July 1980.